Over 25 Years Of Specializing In Jamaica & the Caribbean! Trips are listed with the most recent first. The 4th Annual Yogi Invitational was another great success! Sandals Emerald Bay was hitting on all cylinders this trip. Food and service were excellent. We took advantage of room service for breakfast each morning which saved tons of time so we didn't need to rush for our 9:00 am tee time each day. Sandals Emerald Bay golf course was in great shape. A little wait for on the few first holes and then things would I open up. We figure most guests run out of golf balls by the fourth or fifth hole and give up and go to the bar! Great weather – except for an hour long drenching and windy rain storm one day that ran us off the course on the 14th hole, but rain checked carts entire round for next day. (Green fees are included for most rooms). We go this time of year for golf, not water activities as pools are usually a little on the cool side. This time, however, sunny skies and mild temps allowed a lot of “comfortable” pool use. As always, beach was awesome; ocean water was great – by far best beach and water of all the Sandals Resorts. You have to see it to believe it! Food -Jerk Shack and Dino’s (pizza) - always good for several stops. We dined at Drunken Duck a few times, lots of fun –Sunday Specials are great! Italian and French were both over the top as usual. Soy (sushi) was so good we overate a little. (Just keep bringing something different!). Indian was also good. We skipped Kimonos and Barefoot this time around, just ran out of time! Of course several tips to Café de Paris –mostly for latte with Bailey’s! Bars- Unlimited top shelf liquor as always - Great Margaritas at the Soy-Kimonos-India bar. Pool bar could stand to be a little quicker with service. Too bad Drunken Duck isn’t open more during the day. Another great STAR Awards celebration. Golf participants for the 3rd Annual Yogi Invitational had to deal with some wind and weather, but was still a great success! As usual, Sandals Emerald Bay golf course was in great shape. The new restaurant complex with India's (Indian), Soy (Sushi), and Kimonos (Japanese Grill) is awssome! It is also home to great bar! Italian and French restaurants were both excellent. Due to cloudy and cool weather, pools were a little on the cool side. Ocean water was little rough this time, but beach was great. In our opinion this beach is by far the best beach of any Sandals (almost any resort). The 2016 Sandals STAR Awards returned to Beaches Turks & Caicos forteh 2nd time in three years. As usual BTC pulled out all the stops, providing a great celebration. Things started off Thusday night with a beach party as only Sandals can put on. Wow! The new airport in Antigua is a welcome improvement over the old one. It was raining hard when we arrived. The covered jetway was a nice surprise since at the old airport we would have to walk throught the rain to the terminal. Immigration was one of the most efficient and friendliest we have experienced in the Caribbean. Maybe because the the work enviorment is so nice now! A twenty minute ride delivered us to the Mediteranean Village lobby. Much to our surprise we were greeted by our butler (which meant we had been upgraded to a Butler Suite). This was followed by an even bigger surprise we taken the the 7th floor and shown into our Oceanview Penthouse One Bedroom Butler Suite! (One of the best rooms a the resort). What a view of Dickenson Bay and Sandals Grande Antigua! A great beginning to our stay only got better from day to day. Great service at the pool bar, restaurants, spa, and every where else. The staff here is the best! Food was awesome, weather was perfect (we left hours before Hurrican Matthew wandered into the area). Getting there required a 5 hour layover in Miami from 5 am to 11am. If you have a long layover I highly recommend you spend the time in either the Admirals Lounge or Centurion Lounge. As usual it is a quick trip through immigration and customs in Exuma. Then about a 10 minute ride to Sandals. It took longer to check in and get to our room then we spent at immigration, customs, and the transfer to Sandals. Never have figured out why it takes so long to get checked in at Sandals. We ended up in a 2nd floor one bedroom ocean view room in Beach House #2. We like the upper floor for view and privacy. (3rd floor has better views but only a pergola for shade on balcony so can get a little hot). Great room for both location and comfort. The beach was in great shape with very little in the way of seaweed and of course not a rock to be found. (In my opinion this is Sandals’ best beach) The sand at Emerald Bay is so fine and deep it is very hard to walk in. Once you get to the water's edge it is firm enough to walk or jog. Restaurants were humming right along and the food was very good. Not much different from my last trip in January. Our butler service was hit and miss. The Bahamian butlers were not very attentive or on the ball. We had one butler form Jamaica and he was awesome. Bar service at the pool bar was excellent one day and horrible the next. Seems it depended on who was bartending. Bar service at the piano bar was usually very, very slow. We didn't care - having too good of time. Got in a three rounds of golf. The course was in excellent condition. If you are a golfer be sure to bring your own clubs. The rental clubs are old and in terrible shape. Also bring lots of golf balls. If you run out it will cast $15 per sleeve (3 balls). Unless you have a very low handicap you can count on losing a whole lot of balls. Low handicappers will lose a few too. This was a quick 4 day golf vacation for two guys. Even though Sandals is “couples only”, as long as two guests you can book however you want. We simply requested a rollaway and all was good. Because we wanted plenty of room we booked a Prime Minister One Bedroom Beachfront Villa. This was a perfect room choice that had two bathrooms with showers, huge living room area and large bedroom. It was right on the beach with a great beach front patio to hang out on after golf. A little pricey, but well worth it. January provided perfect golf weather, however not such great weather for water activities. The main pool was pretty much deserted most days. Only one day provided the full sun starting at sunrise that is required to warm the water enough to be enjoyable. Most mornings started overcast with full sun taking over from about 1pm on. The beach was awesome and ocean temperature was tolerable. The food was excellent at all restaurants, no complaints. The only bad night was the street party night. Lots of buffet food, but no place to sit (the tables were full) and music was unbearably loud. We just walked around and sampled different items. Each morning started around 9 am with a round of golf on Sandals Emerald Bay golf course. The course was in great shape. This is a great golf course. Most of the back nine at Sandals Emerald Bay is right on the ocean. It is very challenging. We were glad we brought lots of golf balls! Our butlers took good care of us hauling our golf clubs back and forth to the course. We called them from the 9th tee and they would have lunch ready for us to pick up at the clubhouse when we made the turn: pizza one day, sandwiches the next, etc. We plan on making this an annual trip. Another great (4th) trip to Sandals Emerald Bay. As usual, the resort is beautiful. The grounds, pools, rooms, restaurants, and golf course are simply awesome. This is by far the best beach of all the Sandals. Beach, golf, rooms, and food keeps us coming back! The food was excellent, especially at the Drunken Duck and La Parisienne. We wanted to go in April to get an idea of the early spring weather, knowing the Bahamas tend to be a little cool in the winter. The first few days were cloudy and a little breezy at times, but that was great for our kite flying activities. However, when cloudy, the main pool was to cold for anyone to enjoy. Only two or three brave souls spent any time in the water. Once the sun came out the pool heated up. Our last three days were the best, sunny and warm. It would add a lot of value if Sandals would heat the pools at the Bahamas resorts. There are few staff members who lift themselves above the crowd. If you find yourself headed to Emerald Bay in the next few months seek out Dewittney in the Drunken Duck, Nestor at the pool bar, Anfroy at Barefoot, and Norma at Cafe de Paris. And, if in a butler room be sure to keep in contact with head butler Stephen. 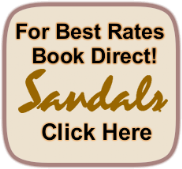 As in the past, the only downside to Sandals Emerald Bay is the service. Not that service is bad, just not up to what we are accustomed to at Sandals. For those with nothing to compare it to, the service will be acceptable. However, if you are used to Jamaican hospitality, don't expect that same level of service or you will be disappointed. You will only find it here from the few remaining Jamaicans and a few Bahamians that are from the smaller islands. We spent a lot of time listening to other guests so we know our experience was similar to that of others. As long as you know this and are ready for it you will have a great time. We sure did! It all started Friday with the stretch limousine waiting for me at the airport. Once at Sandals, check-in was quick. I has few hours to kill before the first scheduled function so I toured the property and checked out the new swim-up lagoon suites. These are very nice. The suites bask in great afternoon sun and were warm even this time of year. The entire next day (Saturday) was spent exchanging ideas with Butch Stewart (Founder & Chairman of Sandals), Adam Stewart (CEO), Ellen Bettridge, and other Sadnals executives in a round table meeting. That evening we departed for a sunset cruise on Butch Stewart's sport fishiong yacht. Another amazing event, fully catered with great food and drink. On Monday, Sandals provided their corporate jets to fly 18 agents (9 on each jet) to Grenada to check out the new Sandals La Source. Unfortunaley I drew a short straw, along with 7 others, and had to stay behind in Nassua! As a consolation, those of us left behind were invited to join Butch Stewart for lunch with the Hon. Perry Christie, Prime Minister of the Bahamas. Another unbelievable trip to Sandals Whitehouse! The improvements just keep coming. Took a day to vist Sandals Negril and Beaches Negril. Great things are happening there as well. We made our fifth visit to Sandals Royal Bahamian to attend the 2012 Sandals Travel Agency Recognition (S.T.A.R.) Awards. We were provided an Oceanfront room in the recently renovated Balmoral Tower. We recommend these oceanfront rooms (although not suites) to anyone heading to Sandals Royal Bahamian. The festivities included a great beach party on Sandals Island, lots of free time to enjoy the resort. The "high" tea each afternoon is a great opportunity to meet and talk with other guests. The pools here are great, but a little on the "cool" side this time of year. Another great stay a great resort! It seems almost like a different resort with the new fire pits, beach walkway all the way to the French pool, and other improvements . This Sandals is simply amazing. This is the jewel of the Sandals collection. No crowds, no hassles, awesome beach, golf, food, and rooms. This visit was to attend Chairman's Royal Club Retreat. Highlight was ribbon cutting for new French restaurant. This restaurant is now the best restaurant of nay Sandals. It is worth the trip just to have dinner here. Simply Unbelievable! My first visit to Sandals Emerald Bay, but definitely not the last. Wow, another amazing time at Sandals Whitehouse. As usual, we greeted at the airport by Mr. Lloyd Lewis. His new sedan for private transfers is the ultimate in comfort. Using his service should be a required investment for anyone traveling to Sandals Whitehouse, Negril, or Ocho Rios. We arrived at Sandals late (about 10:30 pm). We were taken directly to our Penthouse Beachfront One Bedroom Suite where our butlers Ainsley and Keen had set out a welcome snack plate and left a bottle of champagne on ice. A welcome treat after a long day of travel! The huge balcony alone makes these rooms awesome. Add in jacuzzi tub, walk in shower, double vanity, and separate living room and bedroom --WOW! During our stay we ate at every restaurant at least once. The food was awesome at all. The service was great as well, actually a little quick at times for Jamaica (we like the relaxed pace that is typical). Sherree, who handled the counter at Cafe de Paris, learned our preferences by the second day. As there is always line, it was nice to have our coffee and pastry waiting for us when it was finally our turn. Our butlers performed their magic. Our favorite chairs were always reserved at pool or on beach along with a stocked cooler. Our personal "happy hour" appetizer platter (shrimp, cheese, crackers. etc) along with champagne on ice was always waiting for us when we returned to our room each afternoon. The unpacking was a treat, everything hung and folded much better than we would do. Ainsley even folded and arranged things during our stay! One great advantage the butlers add is dinner reservations. Although our preferred times were not always available, we had no waiting for a table. We jumped aboard the "Soul Rebel" for the sunset cruise. A catamaran trip is another thing everyone should do while at Sandals. We compared notes with some guests who tool the Pelican Bar cruise. Their description of that party crowd made our group look pretty tame! Our trips to the spa were too short, as always, but totally relaxing. The weather was perfect, with short, cooling showers a couple of afternoons. I took one day and had Lloyd Lewis drive me to Montego Bay. His skillful driving got us there in a one hour 15 minutes, Not Bad! While in Mobay I went to Sandals Carlyle, Sandals Montego Bay, and Sandals Royal Caribbean, It was good to see my friends in management and get updated on those resorts. This Sandals experience was one of our best. Our only complaint is we were only there for seven nights! What a party! Any guests that were lucky enough to be at Sandals Whitehouse during this time must have had a blast. Awesome beach parties, great entertainment, for Sandals STAR Awards. A short getaway to check out Sandals Negril. We were upgraded to a Penthouse Crystal Lagoon Suite. The old Sundowner block is definitely the place to stay while at Sandals Negril. This combo (Whitehouse & Beaches Negril) is one of our favorites. Marks our 4th stay at Sandals Whitehouse and our 6th stay at Beaches Negril. They both just keep getting better. Our butler met us upon arrival and took us to our oceanfront one bedroom suite, the same room we occupied in October '07. All guests we talked to were having somewhere between the time of their life and the best week of their life. The non-stop entertainment was a blast for both participants and spectators. Just as it has been for years, the service was impeccable, and food was great. Try as we may to find something to complain about, this stay had no problems whatsoever. Our butlers, which are included with our suite, provided their usual surprises and extra special care. We highly recommend butler level for anyone who wants a vacation that is a cut above the norm. Although it may seem a little pricey, the best rooms and service are definitely found at the butler level. During our stay we traveled to Sandals Ocho Rios for their Returning Guests cocktail party and dinner at Reef Terrace. WOW! Best part is we got to spend a few minutes with the hotel managers, our friends from way back when. Our arrival at Sandals Royal Caribbean provided the only glitch during our entire week. Our butlers at Sandals Royal Caribbean weren't prepared for our arrival due to a miscommunication from our butlers at Dunns. However, true to the Sandals butler professionalism, they recovered in just minutes once the knew we were on property. Because we arrived so early in the day, as we expected, our room was not ready. We planned this to see how they handle early arrivals. We were taken to the concierge center to check in, then our butler took us to some pool chairs reserved right outside our room. Our butler supplied cold bottled water and offered to bring us anything else we needed. We spent a couple of hour relaxing in the river pool and enjoying some snacks from the beach grill until we were taken to our Royal Honeymoon Swim-Up 1 Bdr. River Suite. Our suite offered zero-entry access to the lazy river from a patio large enough for a love seat and table and chairs. We had an expansive living room complete with 42" plasma TV, separate bedroom with 37" plasma TV, fine mahogany furnishings, tiled floors, whirlpool bath and walk-in shower. This suite is a sure cure for those who say they won't spend much time in their room anyway. We enjoyed room service every morning for fruit, pastries, juice, and coffee. Our butlers provided afternoon snacks and champagne. Because of our short stay, we were unable to secure a reservation at the French restaurant (Le Jardinier). No Problem! Our butler simply brought the restaurant to our room! We enjoyed an unbelievable dinner! Our 5th stay at Beaches Negril was the first for our entire family. As always, we took along our son (31, who is developmentally disabled), our daughter, son-in-law, our grand daughter (2) and grand son (5 months). What a great trip! We fit comfortably in a two bedroom suite, using the living room as a nursery with a crib (for 5 month old) and pull out queen bed (for 2 year old). Too many highlights to list all, but the Sesame Street Character Breakfast comes in first. This Sesame Street event is a must for anyone with young children. We dined, danced, and had photos with Elmo, Bert & Ernie, Cookie Monster, Zoe, Grover. Our grand daughter spent the entire week socializing with the Sesame Street gang: Dancing with Zoe, baking with Cookie Monster, story time with Elmo, and more. And of course our Butler for the 2nd time, Conrod, took good care of us. The next highlight was our daughter's 30th birthday party put on by Conrod. Cake (with candles), champagne, hot appetizers, music, gifts, and party decorations was all provided as a surprise. We kept the honored guest in the spa for a few hours getting a pedicure and massage treatments while the butlers prepared our living room for the party. Other butler provided perks included reserved beach and pool chairs complete with stocked cooler, laundry service, scented baths, and room service. For anyone worried about weather (particularly hurricanes), we enjoyed the company of Hurricane Paloma for our entire stay. Although overcast most of the time, we got moments of sun and hardly any rain. The main effect was the sea was really rough one day, closing the beach. Otherwise all activities went on as normal, even the four or five weddings that occurred each day. Comparing this stay to our one a year ago, everything at Beaches Negril is much improved. The property is in great shape, the food is the best it has been in years, and the service is as always, Jamaica friendly. Finally, we again took advantage of a private transfers with our friend Lloyd Lewis. We recommend him to anyone, but especially if you are a family traveling with children. Off again to Whitehouse! This time strictly business. This trip really showed the advantage of arranging a private transfer. Within five minutes of exiting customs, I, (along with a coupled I had booked to Sandals Dunns River) were on our way. We dropped my clients off at their hotel in Montego Bay (Lloyd would drive them to Dunns River in the morning). Lloyd and I then proceeded to The Pelican Restaurant for dinner. (Great food and right on the way to both Whitehouse and Negril). Lloyd then drove me to Sandals Whitehouse. A few miles from the hotel, we came behind a bus driving like crazy. We followed this bus right into Sandals Whitehouse. The guests on this bus had all arrived on the same flight as me! And they we just getting to the hotel the same time a me. And boy, where they all in a bad mood. I highly recommend you arrange a private transfer and enjoy your vacation from the very beginning! As always Whitehouse delivered the best in food, service, and ambiance. A great time, but way too short! Sandals Whitehouse continues to prove it is "the Sandals" the other properties aspire to be. As always, service was awesome, room was perfect, food was great, and the relaxation of the South Coast cannot be equaled. Once again we took advantage of Sandal's "Butler Service". Although our Butlers provided great service, we have been forever spoiled by Conrod, our Butler at Beaches Negril (Oct 07). Strictly business. Time was spent doing site inspections at Royal Plantation, Sandals Dunns River, Sandals Ocho Rios, Beaches Boscobel, Sandals Montego Bay, Sandal Royal Caribbean, Beaches Sandy Bay, Beaches Negril, Sandals Negril, and Sandals Whitehouse. Highlights included dining at Royal Plantation, Beach party at Sandal Ocho Rios, Italian Theme Party at Sandals Dunns River, Island Party at Sandals Royal Caribbean. Great transportation provided as usual by Lloyd Lewis. We took advantage if the Butler Service and we are now permanently spoiled! Sandals Dunns River could very well be the best of what Sandals has to offer. More Butler treatment, almost too much! The rose petals, drawn baths, champagne and chocolates, private dinner on the beach, cooler with cold drinks under the cabana, VIP dinner seating, the list of pampering is never ending! Our Butler, Conrod, has perhaps set the bar too high for any other Butler to reach! Our first extended stay on the South Coast since 1997 was simply awesome. We recommend Sandals Whitehouse to anyone who is looking to get off the beaten track, wants to experience a Jamaica with few other tourists present, and wants easy access to some of the best sightseeing attractions in Jamaica. Our return to Bamboo Avenue, Middle Quarters, Appleton Estate, YS Falls, and Bluefields showed little has changed in the last 9 years. Still laid back and non-commercial, the South Coast remains one our favorite areas of Jamaica. The resort design is the best yet for Sandals. Every room faces the beach (which goes forever) and ocean. You are never far from a pool, two with swim-up bars. The restaurants (except Jasmines) were excellent. We enjoyed the best Caribbean night we can remember, whether at Sandals, SuperClubs, Couples, or any other resort. PLEASE NOTE: In 1999 we opened Aspire Beyond, a charitable organization that provides a day program for developmentally disabled young adults. Although our travel agency business itself was not affected, our personal travel was greatly curtailed by the responsibilities of this endeavor between 2000 and 2006. Caribbean Cruise (RCCl) & Sandals Royal Bahamian (Nassau). Non-business family get together. Spent a wonderful day at Sandals Royal Bahamian (Nassau). So many people ask us to compare Jamaica and Hawaii we figured we better go check it out! So we did! We enjoyed a great trip with time spent on Oahu and Maui. We can now give you first hand ideas about how beaches, people, hotels, sights, and costs compare. We spent the week in Ocho Rios at Beaches Grande Sport (Ciboney). The hotel is coming along after being taken over by Sandals. We took our 8th trip up Dunns River Falls, returned to Wassi and Fern Gully. We enjoyed two fantastic dinners, one at Casanova at Grand Lido Sans Souci and the other at Reef Terrace at Sandals Ocho Rios. We were able to check out the improvements at Sangster, which are really nice. A truly relaxing vacation. Full trip report details are available to subscribers. A great vacation in Negril at Beaches Negril. Took in the sunset cruise on the M/Y Zein at Grand Lido Negril (as good as ever). A great trip for the GRAND OPENING of the Sunset Bluff area at Sandals St. Lucia. Enjoyed a golf tournament with Sandals executives, a great party at Sandals Halcyon, excellent food and great room. Took a short trip on Sandals private jet to Antigua for breakfast and to check out Sandals Antigua on Feb 5. As usual, the trip was way too short! A great vacation in Negril and Mobay. Stayed at Sandals Negril and Sandals Montego Bay. The Spa a t Sandals Negril is better than ever! (This has got to be Sandals best!) Had a great day on the "Hip Strip" (as usual) just hanging out, shopping, dining, and talking to the locals. Just a quick "all business" trip to set up some new programs at a few hotels. I did manage to make some quick stops at Couples Negril, Grand Lido Negril, Sandals Dunns River and several EP properties. Highlights were an hour in the Spa at Sandals Negril, Lunch at Sandals Ocho Rios with Glen Huntington (Sandals Inn GM), and another nice lunch at Sandals Royal Jamaican with Melaine Myrie (Sales Manager) and dinner with some friends at Tokyo Joe's (Sandals Montego Bay). I also had a excellent dinner at Marguerites By the Sea Restaurant (Montego Bay). Three days of spa treatments, excellent food, and that "royal" service. This place is a whole new resort compared to when we were here for the Grand Opening two years ago. New restaurants, 200 new rooms (mostly suites), a great new pool all add up to a great resort. The facility here could be Sandals' best, however the Bahamas are just a tad bit cold (temperature wise) for us. A short trip down to Baja. Temperatures were unseasonably cool. A rather pricey locale. You just can't beat the Caribbean! A whirlwind trip to check on our friends at Beaches Negril, Hedonism II, all the Sandals, and Rio Chico. Everything was looking good with lots of renovated rooms and other improvements. We escorted a bunch of golfers from Red Rocks Country Club to a Golf Tournament at Sandals Golf & Country Club. A great time was had by all! As always, our stay was too short. The management and staff at Sandals Ocho Rios and Sandals Dunns River went way beyond expectations in the attention and service they gave us. Total relaxation, excellent food, great weather. Trip was too short! Family Vacation at Beaches was awesome as usual! We were also invited to Grand Lido for dinner and got the VIP treatment. The two college girls with proceeded to Hedonism II for the toga party, arriving back at Beaches with the rising sun! Sandals Royal Jamaican was as royal as ever. Checked out the new Spas at Sandals Dunns River and Sandals Negril. Highlight of the trip was a going to the Cool Runnings Bottled Water Company in the hills outside Montego Bay. Stayed at Negril Gardens. (Negril); Treasure Beach Hotel (South Coast); Four Seasons Hotel (Kingston); Dragon Bay Villas (Port Antonio).